Xyron 1255 Two-Sided Laminate Refill 150'. 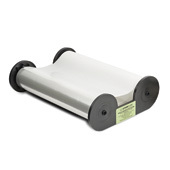 This two-sided laminate refill cartridge fits the XM1255 Xyron Pro 1255 Laminator. This high gloss film is suitable for use on a variety of substrates. Acid free laminate allows superior adhesion and is compatible with most media. Laminate is 12 inches wide on a 150 foot long roll. Xyron 1255 Laminate/ High Tack Permanent Adhesive Cartridge.